Designed for the Alpha male. Compliment your physique with premium fabrics and a perfect fit. 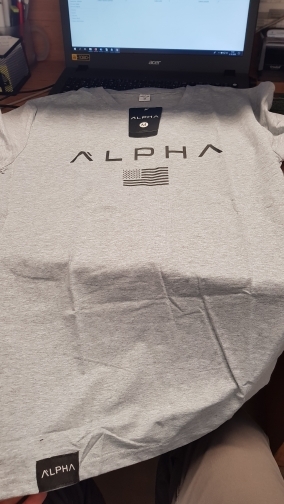 Alpha male is wearing a Large. He is 5′10 tall and weighs 210 lbs. Awesome shirt. It fits perfect and the material is high quality. Very fast shipping, great price and excellent customer service. Thank you Epic Sporting Mall! Great customer service, fast shipping, and low price. Fast shipping and awesome quality! Will buy more of these for sure in the future! Fast shipping! I will be ordering more from this store when new releases arrive. Great shirt. Epic Sporting Mall is awesome. They offered me free shipping and the price was lower when compared to other stores. Thank you for great customer service! Bought this specifically to wear on days that I workout arms. It fits perfect and feels tight around my arms and shoulders but not too tight around the stomach. Thank you Epic Sporting Mall! So happy that my shirt arrived. I ordered it just in time for my Dad's birthday. Epic Sporting Mall replied back to my email and answered my questions in a timely manner.